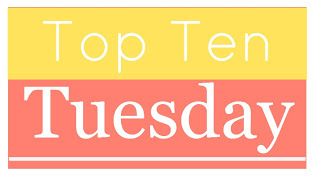 Top Ten Tuesday is weekly book blog meme hosted by the lovely girls over at The Broke and the Bookish. This week's Top Ten Tuesday topic is a Thanksgiving freebie, so I have chosen to keep it simple and go with ten bookish things I'm thankful for! 1. The Tumblr booklr community. I most likely wouldn't even have this book blog right now without Tumblr and the incredible booklr community. Everyone was so welcoming and fun and I finally felt like I had found a place where I could spend time with those who are just as passionate as I am about books. 3. Goodreads. Say what you want about Goodreads and some of its flaws, you can't deny that this is a great source to keep track of yours books, connect with others who like to read, and discover tons of great new books. I particularly love the 'lists' section, which has introduced me to so many great books - though I try to avoid lists with 100+ books... that's just way too intimidating. I use Goodreads as my main method of tracking my books (though I am currently working on a spreadsheet as well), and it is perfect for what I need, not to mention it is a great way to keep track of bookish things! 4. Book Riot. For some reason, I wasn't a fan of this site when I first stumbled upon it a year or so ago. Why? I honestly have no idea. Now I love it. Not only is insanely passionate about all things books, but it focuses so much on the bigger issues that plague the publishing industry, such as diversity in literature, reading stigmas and stereotypes, and so much more. I also love all of their podcasts have been introduced to so many great books because of them. 5. Libraries. Do I really even need to go into this? Even though I often rag on my library a little bit because it is so incredibly small and doesn't really do all that much, it is one of the top ways in which I obtain books. I mean, come on - free books!? Granted, they have to be returned, but I don't even care. Interlibrary loans have allowed me to read so much, and for that I am eternally grateful. Libraries are also so important to so many communities, and I hope to always support local libraries whenever and however I can. 7. Booktube. So not only do I get to read about books on the internet and listen to them from podcasts, but I also get to watch people talk about and show off their beautiful book on the internet! The Booktube community is not without its faults, and I certainly have my favorites and no-so-favorites, but pushing that all aside, the basis of this entire idea is absolutely wonderful. I love watching book hauls, reviews, recommendation videos, tags, you name it! 8. Open-mindedness. Specifically, open-mindedness within the book communities. Everyone is so open toe everything, and I love it. Discussions are always welcome, and people are free to agree and (respectfully) disagree all the time. I feel like I am in a very safe space, and I often forget that not everyone is as open and friendly about things as those I often interact with on the internet. And I love the push for more diversity that has really taken root - it is absolutely needed and I am so glad more and more people are taking a stand every day. 9. Netgalley. As a book blogger (and avid reader in general), Netgalley is a gift. ARCs in general are awesome, but Netgalley brings that opportunity to read advanced copies to so many more people and it is a great resource to have a chance to read some amazing new releases! 10.. Other book bloggers. Seriously. You guys are all amazing, and I wouldn't even care about my own blog if I didn't have other blogs to enjoy as well. Each and every book blog out there - no matter how big or small, no matter whether you host giveaways or only post reviews are or mainly post book related content or anything else - contributes so much to the community and I love nothing more than interacting with you all. I don't think I could ever complete a full list of all of the blogs I enjoy, but just know that I love you all. What bookish things are you thankful for? Feel free to share in the comments! Great post! I utilize all these sites as a librarian as well. I really enjoy your list. Love your list, and especially your love of Indie Bookstores! I started working for one this past summer (Fountain Bookstore in Richmond, VA, where we're lucky enough to be Maggie Stiefvater's home bookstore). I'm also lucky enough to have an amazing library near me. And I'm so thankful to be part of this great community! Happy Thanksgiving! I have to say a big yes, indeed to all of these! Happy Thanksgiving. Wonderful list! :) I think I can agree with pretty much everything. Goodreads, libraries and the such are things I'm very thankful for as well! I agree with you on so many of these, especially Indie bookstores, Netgalley, and other book bloggers. Great list! Such a great list. I've been a fan of Book Riot since the beginning, and it's kind of fun to see how it has evolved and expanded since it started. I find Booktube to be challenging as a booktuber of color, but I wouldn't trade my relationships with other black booktubers for anything. Happy reading!